Personal Training is great for so many people on so many levels. Maybe you want to get into water fitness classes but you are a little hesitant to jump right into an existing class, not knowing all the basic moves. A few sessions and you will be confident and comfortable. Trying to lose weight? Personal Training is a great place to begin. 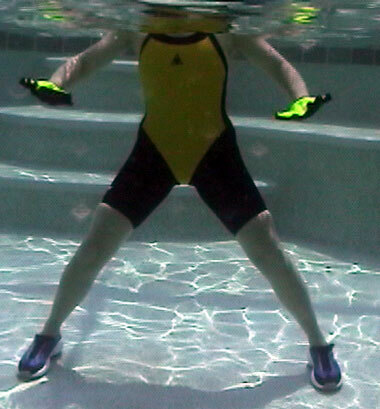 Together we will discuss your goals and design the perfect water fitness program for you. Maybe you need a little extra work on those hard to tone areas. Or your core needs tightening. We will examine together and choose the right exercise at the best level of impact and resistance for you. Want to cross-train? Every runner, golfer, tennis player, etc. wants to up their game. Personal training is a great way to have a work out designed just for you that will do just that. Whether it is strengthening a specific muscle group or working on flexibility, we can get you moving better and you will see results. This is how it works. I usually recommend 5 one-hour sessions. The first hour we sit down together and discuss your goals and special needs. We do a full assessment in the shallow and/or deep water. This assessment will tell us exactly what we need to focus on. You will be surprised at what you learn about your body during this assessment. After the first session I will design a personal work out focusing on what we found and what your goals are. The next 4 sessions are spent getting you comfortable with your work out, observing your progression and determining if we need to adjust or increase your work out. No two people are the same. Group lessons are fun and a great way to exercise and socialize, but to really see results it is best to focus on your needs. Once you have this knowledge you can learn to adjust it to any group water fitness class and maximize your work-out in a private or group setting.